Lean Camp is an Open Space conference for lean startup practitioners, and a practical, high-energy day connecting Lean Startup and other communities. The San Francisco Lean Camp event was held in December 2013, the Sunday before the Lean Startup conference. As an unconference, the sessions are organized during the day, so the event is reflective of the needs and goals of the community. It’s pretty awesome. I was able to capture sketchnotes of the opening welcome talk by Salim Virani (@saintsal) and for six sessions, as seen in the gallery. 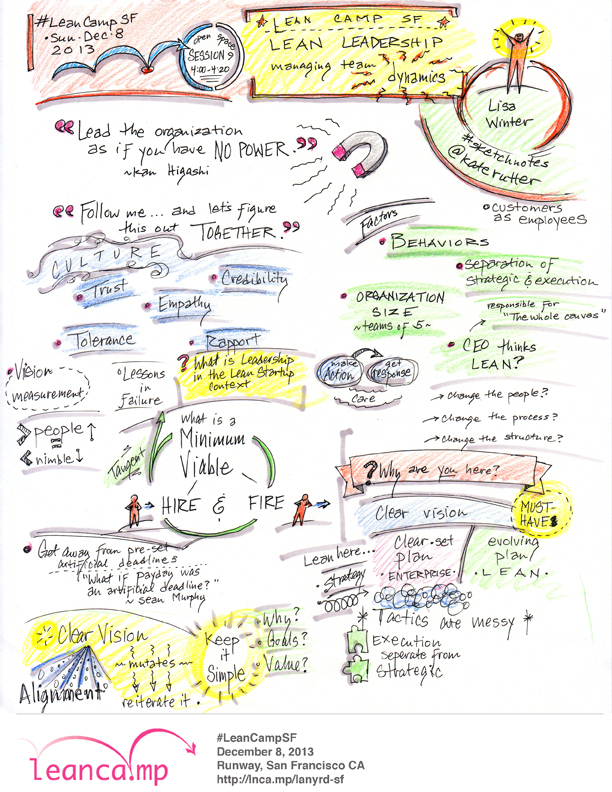 You can download high-res versions of these sketchnotes on Flickr. There were multiple tracks all day, so be sure to check out the notes, decks and other materials on Lanyrd at http://lnca.mp/lanyrd-sf.